The Midnight Review: Why Scalia's DOMA Dissent Is Full Of Crap. Why Scalia's DOMA Dissent Is Full Of Crap. Scalia calls for judicial restraint because this law was democratically adopted. He insists that the DOMA ruling was "an assertion of judicial supremacy over the people’s Representatives in Congress and the Executive." So because the law was enacted by a majority of our duly elected representatives Scalia believes the court should not have intervened. He also believed there was no case to begin with, but as he states, even if there was it wasn't for the court to decide and should be left up to the democratically elected legislative and executive branches. This is funny because Scalia has pretty much made a three-sixty in pretty much every of his other rulings of importance in which a progressive law was either struck down or upheld. 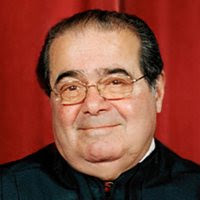 In the case of NFIB vs. Sibelius regarding the Affordable Care Act, Scalia cried for judicial intervention. His criticisms of the law didn't even touch upon the standing question that he had for DOMA despite the fact that the parties suing to overturn "Obamacare" had not been affected by the law yet because the provisions would start to kick in a year after his ruling. And how about the Voting Rights Act ruling? Scalia dismissed the overwhelming democratic adoption of the law calling the re-authorization by congress a "perpetuation of racial entitlement." Earlier this year Scalia argued with Ted Olson about gay marriage demanding when gay marriage specifically became unconstitutional, and since that question could not be answered he could not possibly rule on it. So basically, Scalia was predetermined to rule in favor of DOMA. This whole issue of standing is just a mask for his hypocrisy.